I must start off by apologizing for the photos. 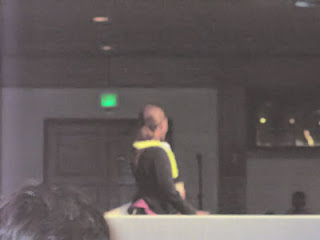 We were sitting pretty close but I felt uncomfortable taking pictures in a Church. My family and I and what appeared to be all of Oahu, just kidding... but it was standing room only, went to see and hear Immacule'e Ilibagiza last evening. 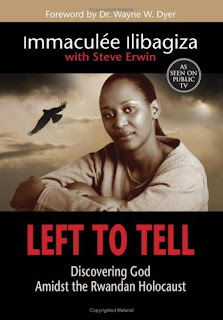 For those of you not familiar with this amazingly spiritual lady, she was the only member of her family who survived the horror of the Rwanda genocide, in 1994. She is a beautiful and graceful woman. She spoke in a soft voice and many times she made us laugh. This morning as I reflected on her talk last night, I was impressed so deeply that someone who had lived through a nightmare beyond our normal comprehension, could still be funny and love life. She and her family were Catholics and members of the minority Tsutsi tribe in Rwanda. Their nightmare began when the President of Rwanda died. Her parents told her that she must go into hiding. They sent her to the home of a neighboring Protestant pastor and a member of the rival Hutu tribe. Before she left her parents, her father gave her a Rosary. The pastor told her that he must hide her or she would be killed. In that short time, she and another seven women were hid in a bathroom that was 3' x 4'. They were instructed not to flush the toilet or talk. For the first two days, they weren't even given food to eat because of fear that they would be found. Finally, the pastor was safely able to bring them something to eat. During this ordeal where she and the others learned that people were being killed, she felt anger and hatred. She prayed the Rosary but at the parts of the Our Father where she had to pray "and forgive us our trespasses as we forgive...." she just skipped over that part. She could not forgive the killers for what they had done. There were a few times when the killers searched the home of the pastor. Immacul'ee would pray to God thusly "If You are real, don't let them find us". God answered her prayers because she heard the killers tell the pastor..."You know we trust you. There is no way you can hide those cockroaches...enemies of the country". They were in fact standing right outside the bathroom door. During this time she continued to feel fear and anger. She felt that their ordeal must be worse than Purgatory because at least in Purgatory, we have no body to feel pain. She continued to pray the Rosary but now she prayed to stop being angry and feeling hate. 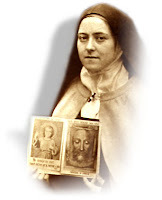 During her days in hiding she would pray about 7 Rosaries and 14 Chaplets of the Divine Mercy daily. So she continued her interior struggle between love and hate, realizing that both emotions could not live together and still have God on her side. She finally asked God to help her forgive. 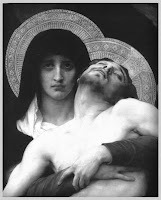 Immacul'ee told us that it was only during this time in hiding that she finally could meditate deeply on what sufferings Christ had endured for love of us and how His mother had suffered. She spoke about the dangerous gift God gave us, that of Free Will. 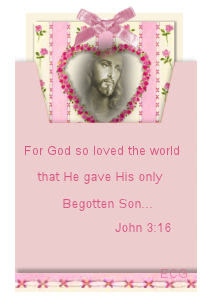 She felt that God must be so sad to see how His gift was misused. By the time she and the others were safe enough to leave the bathroom, three months had past. Immacul'ee said she weighed only 65 lbs. She found out that all of her family members had been killed. All together over a million people were killed during a three month reign of terror. She specifically warned us in the audience that this could happen anywhere and at anytime if we didn't love God and our neighbor. It seems that the people in Rwanda did not like their president at the time before the genocide. They wished that he would die. And, guess what? He did die and that country's nightmare began. She told us not to hate our president but to pray for him....to pray for our country's leaders. Very poignant especially when think about how many in our own country and in the world feel about our current president. There is so much more I could share but I would recommend you read more about her yourself in her book Left to Tell. 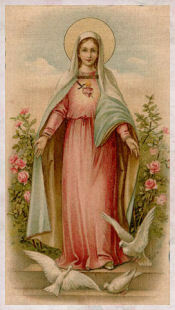 Her message was that of love and forgiveness and above all trust in God. She told us that if we lost everything like she did but had the Holy Bible and our Rosary...and of course God, we didn't need anything else. I noticed that the audience was mixed by that I mean, not all Catholics. 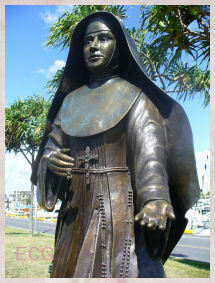 Not once did she mention she was Catholic but she was a one-woman evangelist for the Catholic Church by her simple and loving words. with Your teaching and example. to live in harmony and love toward our neighbor. 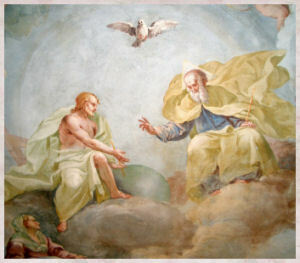 and God the Holy Spirit, who sanctified us at Baptism. The family is under constant attack. It seems like the devil is working overtime to destroy what God has created. All of existence is meant to be familial. Pope John Paul II used to call the Blessed Trinity a family, because it is a structured communion of persons in love, with a Father, a Son and the love between them. The human person was made in the image and likeness of God, "male and female He made them" (Gn 1:27-28), and hence the image of God is familial: a husband and a wife can love each so much that, like the Trinity, their love can generate a third person. They can literally "make love" and then name, raise and live in joyful communion with the love they've made. But man, woman and children didn't live up to their being in the image of God. Right from the beginning, sin invaded the family. It began with Adam and Eve and the first sin. It quickly passed to their children. Cain killed his brother Abel. There was envy between Abraham's sons Isaac and Ishmael, enmity between Isaac's sons Jacob and Esau, envy between Jacob's 12 sons, ten of whom ganged up to try to kill their brother Joseph. There was deadly envy in David's family. The list goes on and on. Simply put, the family had become a mess. As the human family "increased and multiplied," so did sin. Jesus was born of a family to come to redeem the family, which has such a crucial role in the world God created. Isn't it interesting that this week's Mass readings have been Genesis...about God's creation, the Fall of Man. Even in the very beginning the devil started causing trouble in the family. The members of a family need to do the will of God and encourage each other to do the will of God. Many families do this. They inspire each other to become holy and encourage each other to pray. Some of the most beautiful conversions I've seen in the priesthood have occurred during marriage preparation, when the faith of the future bride or groom is so contagious that it inspires the other to start to take the faith much more seriously. The members of the family, by what they say, do and fail to do, will either help the others become holy or help them to sin on the basis of whether they try to do the will of God and encourage the others to do the same. ...When the Holy Family was under attack, God sent His messenger to St. Joseph to wake him up and warn him about the threat. Joseph immediately got up and acted to protect the Holy Family. God is sending you a message. Wake up! The family is under attack. 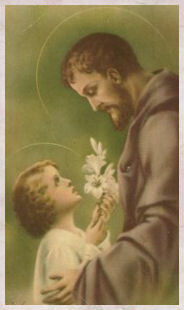 He wants us to get up like St. Joseph and act. We ask Mary to intercede for us and our families, to help them become truly holy. We also ask St. Joseph to intercede so that we might be as courageous in defending the institution of the family as he was in protecting the Holy Family. One of the things I give up for Lent is reading for pleasure. That means, I stop reading novels and magazines and focus more on spiritual reading. Right now, I have a box full of Catholic newspapers and magazines that my mom sent me a while back. I have not found time to read them. She send me Our Sunday Visitor, Crisis, Lay Witness, etc. Starting on Wednesday, I will make a conscious effort to read them all and then share them with others. 1. Heart of Joy: The Transforming Power of Self-Giving by Mother Teresa. telling how God has given them to us as a means of knowing and loving him. temperament hold so deep an attraction for the modern mind. There is one book that I plan on buying tomorrow and that is 101 Inspirational Stories of Reconciliation by Sr. Patricia Proctor. There shouldn't be any debate at all on the Catholic Church's stand on the enviroment. After all, God created the world and all living things and we in turn should be the guardians of the planet God gave us to use. However, you would have to be in deep denial to say that our planet is in fine shape. Look at the serious problem of misusing or wasting these gifts. By overdeveloping once untouched places e.g. Amazon Rain Forest, animals suffer because they are losing their homes. People suffer, especially the poorest and in the end, humanity as a whole will suffer. It just about galls me to see overdevelopment everywhere. In the state where my family live, you hear about black bears being a problem. They come too close to humans. Well, what do people expect since the wooded area that was once their home, has been destroyed and new condos, townhomes or large single family homes built there instead. This problem is seen world-wide now. We need to do something about our planet. First and foremost we should be taking care of our own little enviroment. We should not be wasting our precious resources like water, energy, etc. It is going too far to scare everyone like Mr. Gore and some scientists are doing by pounding into our brains GLOBAL WARMING, GLOBAL WARMING. Not wasting things is a big step in taking care of our environment and you don't need anyone to tell you otherwise and simplifying our lives. - Walk or bike to the store instead of taking the car, or combine trips so that you use the car less frequently. - Turn down the thermostat in the winter, and turn it up in the summer. - Replace incandescent light bulbs with compact fluorescent bulbs. - Educate yourself about stewardship of the earth’s resources. 1. Don’t over-consume. Repair. Reuse. Recycle. 2. Save energy. Replace burnt-out light bulbs with those most energy efficient. 3. Conserve water. Turn off the tap while brushing teeth or shaving; water the lawn after sunset. 4. Take public transportation, car pool, bike or walk to and from work. 5. Don’t litter anywhere: on a street or a beach, in a park or a theater. 6. Keep it down. Avoid noise pollution. 7. Vote: support public transportation, environmental issues, etc. 8. Encourage children to be good stewards through example and community cooperation. Conversation with Christ: Lord, I want to live my life for you. I don’t want to chase after the passing pleasures of this world. I want to set my heart and mind on fulfilling your will and accomplishing the plans you have set for me. Help me to know your will. Inflame my heart to love your will. Strengthen my will to carry it out as perfectly as you ask of me. 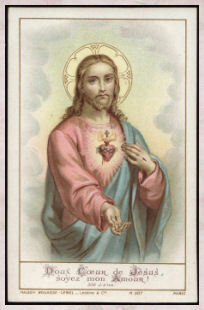 Please grant me the graces that I will need to respond faithfully to your holy inspirations. Resolution: I will look for something positive to say about my parish priest and share this with others. 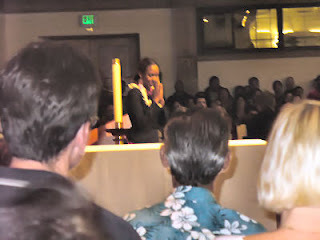 Well, although I don't know our new parish priest very well, I was impressed by the fact that he genuflected before the Blessed Sacrament as he approached the Altar, during the Processional. 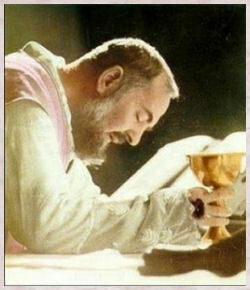 By his example, people in their pews were made more aware of the Real Presence. I DIDN'T NOTICE UNTIL TONIGHT THAT THERE WAS A MISSPELLING. THIS IS THE CORRECTED TAG. SORRY ABOUT THAT. Jesus may hide himself, but we know He is there. "Persons Who Simply Followed a Call of Conscience"
ROME, FEB. 10, 2007 (Zenit.org).- Here is the address given by Lisa Palmieri-Billig, liaison of the American-Jewish Committee to the Holy See, and Rome correspondent for the Jerusalem Post, on the occasion of the presentation of the Italian translation of Martin Gilbert's book, "The Righteous: The Unsung Heroes of the Holocaust." Gilbert's book, originally published in English in 2002, has just been translated into Italian under the title: "I Giusti, gli eroi sconosciuti dell'Olocausto," by the publishing house Città Nuova. The presentation took place Jan. 24. When the black clouds of Nazism covered the skies of Europe and sank to earth as a poisonous fog that infiltrated the privacy of people's lives in the form of near total physical and spiritual dominion, everywhere and despite everything -- single stars of disobedience began to shine, of resistance to the mad orders aimed at exterminating the Jewish people. These stars to which we pay tribute today, were individuals, persons who simply followed a call of conscience: Catholics, Orthodox Christians, Evangelical, Baptist, Lutheran Christians, but also Muslims, non believers and atheists. They came from all social levels and all nations. They were farmers, doctors, diplomats, princesses and kings. They were simple religious and papal nuncios. They came from the political left and the fight, even from the fascist right. And perhaps we could add a category that is never mentioned -- the Jews themselves who consciously offered their lives to save those of the brothers and sisters of their people, and sometimes even the lives of non-Jews. According to the Jewish tradition these were acts of "Kiddush Hashem," the sanctification of the name of the Lord. Here are three examples, but most certainly there are many others to be found. Research in this field has yet to be done. Janus Korczak, a Warsaw physician and educator, stayed with the orphans of the Warsaw ghetto until the very end. He refused offers to escape into security in order to stay with "his" children and go with them on the train to Auschwitz so they would not be left alone with their desperation. The same choice was made by the chief rabbi of Genoa, Riccardo Pacifici, grandfather of today's spokesman of Rome's Jewish community, who bears his name. In full awareness that he was risking his own life, Rabbi Pacifici chose to stay on in Genoa to take care of the last Jews of his community, rather than escape in time. And then there was that soldier of the Jewish Brigade who landed up in Naples. Finding that the Nazis were holding a little boy hostage in retaliation for a partisan action, he organized an ambush and freed the child -- who was the father of a friend of mine. These are stories that are yet to be told. What all these people had in common was the capacity to choose, to react against injustice out of conviction. They refused to close their eyes and hearts to the suffering around them. At the cost of risking their own and their families' lives, they refused to succumb to conformity or to the dulling of the soul through the drumming of evil. "It is better that our children grow up as orphans rather than with the knowledge that their parents did nothing" said one of the righteous women in Gilbert's book. Martin Gilbert writes that these men and women were fully aware of the dangers they were facing "often of the execution of their relatives and themselves" but "they made their choice with serenity, deliberately, in full awareness of the risks -- risks they faced and accepted for months and even years." When, later, they were asked why they did what they had, they replied with great simplicity and some amazement at the question. "But it was the normal, decent thing to do. Wouldn't you have done the same?" This was the reply given by Giorgio Perlasca, the Italian who found himself in Budapest working on the exportation-importation of meats in 1944. A magnificent impostor, he presented himself as the new Spanish consul when Ángel Sanz-Bris fled, to continue his life-saving work of producing identity cards and false Spanish passports for Jews who were suddenly transformed into "Sefardis" -- of Spanish origin -- finding rooms for them in protected housing. There were about 25,000 of these apartments set aside through the influence of the papal nuncio, Archbishop Angelo Rotta, and administrated by the consulates of Switzerland (Carl Lutz), Sweden (the famous Raoul Wallenberg who later disappeared into thin air), and Portugal. Through this strenuous and desperate work, Giorgio Perlasca, with unique bravado, succeeded in rescuing at least 5,000 Jews. Once he even managed to tear two twins off a train destined for Auschwitz. That day, Perlasca growled loudly at the SS commander -- who he realized only later was Adolph Eichmann in person -- shouting that these twins were his and if anyone dared to prevent him from saving them from this deportation there would be extremely unpleasant consequences for the Nazi army in Spain. I had the great honor and pleasure of having known Giorgio Perlasca, and become a friend of his and his family at the beginning of the 1990s when an American-Jewish organization, which I then represented, gave him special awards in recognition for his courageous and selfless deeds. I recall how his wife told me that when he returned from the war, no one would believe him, and it was only when the survivors, mostly women, began to seek him out to thank him nearly 45 years later, that his story slowly became public and he was named "a righteous gentile" by Yad Vashem. It must be remembered that Holocaust survivors could not face speaking about the trauma they had lived through for decades after the war, which is why "the righteous" were honored so late. Enrico Deaglio has written a moving book based on his interviews with Giorgio Perlasca, and a television documentary based on two long conversations was also produced. A few years ago, the well-known film about his life appeared, and today Giorgio Perlasca's son, Franco, heads a foundation in Padua that works with schools to tell this remarkable story and teach the new generations about the Holocaust. Among the righteous, there are also a great number of Muslims -- Muslims from Bosnia who disobeyed the orders of the SS and the Bosnian Muslim collaborationists, Muslims from Turkey whose embassies all over Europe gave protection to Turkish Jews, Muslims from Kosovo and Albania. Glbert writes, "When the German army occupied Sarajevo in 1941, the city's new commandant asked Dervis Korkut, the Muslim director of the city museum, to head the collaborationist Muslim community -- which was to provide a Bosnian Muslim SS division. Korkut refused. "Not long afterward, one of the receptionists at the museum announced that a high-ranking German officer wished to view the famous 14th-century 'Sarajevo Haggadah,' a priceless ancient manuscript describing the Jews' flight from Egypt. "Sensing danger, Korkut hid the document under a display. 'Alas,' Korkut told the German colonel, 'I regret to tell you that the book vanished two yeas ago.'" One year later, the Korkut family, well aware that their lives would be at stake if they were discovered, followed the call of their consciences and love for the other, offering refuge in their home to a young Jewish girl without a family, a home or a document of identity. When one of the righteous from Bosnia asked why he had helped the Jews, he replied, "Because I love them." It is nice to know that 50 years later, during the war in ex-Yugoslavia, the small remnant of the Sarajevo Jewish community was able to reciprocate to a degree by returning some of the heroic kindnesses of those who had helped them a half century earlier. The Bosnian Jews were neutral during the interethnic conflict and offered the offices of their community as a safe haven for all sides, while members of the community crossed the lines of fire to deliver badly needed medicine, in cooperation with a Palestinian doctor who worked in the main hospital. There were also many righteous among the Serbians, including representatives of the Orthodox Church. In Greece too, the Orthodox Church worked actively to save lives. "In Athens, General Stroop summoned Archbishop Damaskinos, and asked for his cooperation in deporting the Jews. Damaskinos left Stroop's office and immediately ordered the Greek Orthodox religious leaders to hide Jews, and to not turn them over to the occupiers. The Jews were also helped by many Italian soldiers in the city, who were regarded by the Germans as traitors to the Axis. Thanks to their support, and that of the archbishop and his church, most of Athenian Jewry was saved." Then there is the story of Princess Alice of Greece, a great-granddaughter of Queen Victoria (and the mother of Prince Philip). She gave refuge in her own house in the center of the city -- opposite that of the archbishop -- to Rachel, the widow of Haimaki Cohen, and to Rachel's young daughter and son Michel. Princess Alice also helped Rachel Cohen's other three sons, Jacques, Alfred and Elia, to escape from Greece and join the Allied forces. Bulgaria was another country where courageous actions by the Orthodox Church, including public protests, took place. When the deportations began, Metropolitan Stefan wrote at once to the king: "'The cries and the tears of the slighted Bulgarian citizens of Jewish origin are a lawful protest against the injustice done to them. It should be heard and complied with by the king of the Bulgarians.' In the northern part of Bulgaria, farmers threatened to lie down on the railway tracks to prevent passage of the deportation trains…." Metropolitan Stefan, Metropolitan Kiril, and "eight other senior churchmen including the highly respected Neofit of Vidin, signed a formal protest to the king on behalf of all the Jews of Bulgaria." Bulgaria was exceptionally compact in its defense of the Jews. The Orthodox Church, the parliament itself, the people and their king, were all solidly and publicly against the deportations. It is clear without the slightest doubt that not only Catholic religious institutions, but also the Vatican itself helped to save the lives of Jews -- as well as those of deserters of the German, American, Italian, French, British armies and politicians in danger. In addition to the many stories told in this book, I can personally testify through the research I have done that new documents continue to be found that prove the extent to which religious institutions and people networked to save lives. I recently saw a document that gives evidence to the fact that Father Pancrazio here in Rome had the approval and help of members of the Vatican Department of State in saving prisoners of the SS headquarters in Via Tasso. Political prisoners and Jews were jailed there. The French College (Seminary) at the Vatican was also able to hide Jews with the help of an official letter bearing the Vatican stamp stating that the college was Vatican property and in Vatican territory, which meant it was off grounds for the SS. However, the Vatican's official policy in its totality is more complex and touches on highly sensitive issues for both sides. So many righteous individuals without means or power -- Muslims, nuns, priests and clergy of all religions, as well as non believers risked their lives to heed an inner calling to moral integrity. In view of this, one could legitimately raise the question of whether anything less could have been expected from a moral authority guiding the consciences of hundreds of millions of people in Europe, and whether an authority as portentous as the Holy See could have remained inert. No, the Holy See did not remain inert. As stated, within so many Catholic institutions, and even within the Vatican itself, the persecuted, including Jews, who knocked at their doors, found refuge. Yet the strategic choices made by Pope Pius XII still seek historical evaluation. I recall what was said to me by Father Pierre Blet, the last of the four Jesuit scholars who edited the series of volumes of documents on "The Holy See and World War II." When he presented his successive book summarizing the topic, he told me that the Holy See's main priority was to help the Allies win the war, while at the same time, for the Catholic Church, fear of the rise of Communism was another major factor in determining policy. Efforts were made to save lives wherever possible, including those of Jews, but the thrust of Vatican diplomacy was, above all, focused on strategies for winning the war. "The Jewish question, at the time, did not exist as a separate problem," Father Blet told me. In Martin Gilbert's opinion, Pius XII could not have spoken out more strongly against the Nazis' persecution of Jews without exposing Catholics, as well as Jews, to even greater dangers. 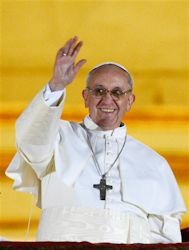 In a recent interview published by the monthly Inside the Vatican, Gilbert refers to the Reich security main office's fury at Pius XII after the Pope's 1942 Christmas message in which he stated his concern "for those hundreds of thousands who without any fault of their own, sometimes only by reason of their nationality or race, are marked down for death or progressive extinction." The Nazi bureau in Berlin responsible for the deportation of Jews "noted angrily, 'In a manner never known before, the Pope has repudiated the National Socialist New European Order.… Here he is virtually accusing the German people of injustice toward the Jews and makes himself the mouthpiece of the Jewish war criminals.'" But there were no subsequent declarations by Pius XII. And the disappearance of the encyclical prepared by Pius XI a few months before his death and never pronounced, remains a mystery. Opposing and contradictory conjectures over what might have become the consequences of a firmer public papal condemnation of the Nazi murders, persecutions and deportations of Jews feed this controversy. Holocaust survivors, with their personal memories, are still alive, and despite this -- or perhaps because of this -- historians are still far removed from a shared and common evaluation. The debate becomes high-pitched with emotions at times, and further complicated, by the lack of access to the Secret Archives of Pius XII's papacy. There are both Jews and Christians who dissent from Martin Gilbert's appraisal regarding the wisdom of the Pope's decision not to go public, and hold that an explicit and authoritative condemnation by Pope Pacelli could have halted the genocide in time. Amos Luzzatto, the former president of the Union of Italian Jewish Communities said recently, "I am not aware of any public acts regarding the gas chambers and the mass murders in occupied Europe," and Riccardo Di Segni, the chief rabbi of Rome, recalled that "nothing was done to stop the train of Jewish deportees to Auschwitz from leaving Rome in 1943." We must above all take into account the context of the times of World War II. The kindnesses, and above all the heroic deeds listed in Gilbert's book, were the stars that shone in the black sky of World War II, while a thick and poisonous fog permeated into the skins of an overwhelming majority of the European population. The terrifying, indescribable horrors of the systematic extermination of innocent families, defenseless babies and children, women, young people and the old, dragged out of their homes and sent to death for the sole reason that they were born of the Jewish faith or heritage, took place in every town and city of occupied Europe. As the historian, Henry Huttenbach, quoted by Gilbert, stated, the few that were saved "had the good fortune of encountering brave and decent people who sheltered them in an otherwise overwhelmingly unfriendly and disinterested Europe. It must be remembered that those who did escape camps, ran away into societies poisoned by anti-Semitic sentiments. The vast majority perished at the hands of collaborators with Germany's scheme to exterminate the Jews, whether Swiss border guards refusing entrance to anyone over 16, or the French police arresting foreign Jews, or Poles refusing to hide escapees from ghettos, or Russian partisans who killed Jews seeking to join them in their fight against the Germans." I quote this statement not in any way to belittle the marvels of the magnificent deeds of all the righteous -- estimated at a total of at least 20,000 by Mordecai Paldiel, director of the Yad Vashem Museum-Monument -- where a forest of trees commemorating the righteous are planted. Rather, on the contrary, Huttenbach's appraisal is useful in helping us to realize what extraordinary courage was possessed by the righteous, living as they did, amid a sea of indifference and widespread, diabolic mass hysteria. The great Pope John Paul II, who personally experienced the horrors of World War II, recognized the negative role played by centuries of anti-Jewish teachings by a part of the Catholic Church -- "the teaching of contempt," as defined by Jules Isaac, the historian and Holocaust survivor, during his significant encounter with Pope John XXIII. This erroneous teaching prepared the ground of the mass subconscious where Nazi anti-Semitism took root making hatred of Jews acceptable and legitimizing or "justifying" their extermination. Despite pre-war Catholic declarations against anti-Semitism, disdain of Jews permeated sections of the Catholic hierarchy (as can be seen, for example, in pre-Vatican II issues of the authoritative periodical, Civiltà Cattolica) right up to the times of the ecumenical council and the historic "Nostra Aetate" document promulgated in 1965. Surviving vestiges of anti-Judaic contempt in catechetical teaching and in the popular culture of certain anti-Semitic Catholic folk festivals (some of which were abolished only decades after Vatican II) centering around child "martyr saints" supposedly murdered by Jews who "used their blood for baking Passover matzot" (the Ritual Murder Canard that often provoked massacres of Jews as, for example, in the case of the St. Simonino Martyr festival in Trent) led Pope Wojtyla to call an International Theological Colloquium in the year 2000, on the history of "Anti-Judaism in Catholic Circles." It was presided over by Cardinal Georges Cottier, theologian of the Pontifical family. This colloquium was followed by John Paul II's unforgettable and deeply moving act of requesting pardon of the Lord for the sins and errors "of the sons and daughters of the Catholic Church." It is all true. It is true that the Catholic Church and the Vatican itself, hordes of priests and nuns, common people, Muslims and Orthodox Christians, believers and non believers alike, with extraordinary courage, risked their own lives to save those of Jews. It is also true that the poison of anti-Semitism on the continent thrived on and was nourished by centuries of the teaching of contempt. And therefore we must all the more appreciate the enormous moral contribution of these righteous, recognizing them as rare lights that shone in the darkness of an epoch. -- As already stated, the historical sources, the famous Secret Archives of Pius XII's papacy, are not yet available -- and even when they will be, we will have to await the elaboration of the new data by respected and trusted historians and researchers of diverse backgrounds. Perhaps, and in all likelihood, a definitive conclusion will never be reached. But with the passing of time, even the conclusion that no absolute conclusions can be found, will be less problematic and other, related, decisions will be less painful for all parties involved. -- It should always be remembered that for survivors and their families, the torment of memories of the Shoah is still vivid and acute. These people rightly hold that had there been more righteous in the entire world at the time, and had the governmental and religious authorities had more moral courage, millions of lives could have been saved and the war won sooner. But today we must look toward the future and grasp the many occasions offered to nourish reciprocal understanding. The multitude of beautiful and touching stories in Gilbert's book strengthen our hope and our faith in the human soul's capacity for goodness. I would like to suggest two projects for the new generations. -- Introduce the study of civic education in school programs to strengthen personal consciences and the critical capacities of individuals based on the ethical values of humanism and the highest values common to all religions. This could be supplemented by the teaching of the art of dialogue and of communicating with respect and without fear of the other. -- Reading and teaching books such as this in school, pursuing further historical research on the rise and fall of totalitarian regimes in the past century, unveiling responsibilities, commemorating the victims, but also searching for the righteous yet to be discovered in this and other contexts, that they may continue to serve as examples and models of the possibilities for human choice under all circumstances. These are some of the strategies that might effectively impede a future repetition, under a different guise, of the horrors of World War II, and the Shoah in particular. As I mentioned in an earlier post, I am currently reading 100 People...by Bernard Goldberg. For the most part, I am reading it because Mr. Goldberg is a very amusing writer and I wanted to see who we are to blame for the country spiraling out of control in some respects. But there was one story on his list that made my blood run cold. It was so heinous that I had to share it with you. #63 on Bernard Goldberg's list of people "screwing up" America is one Amy Richards. To be honest, before reading about her in the book, I was not familiar with her. After reading about her, I can understand why she was chosen to be listed in the aforementioned book. Her sordid little story is about her and her boyfriend becoming expectant parents. She finds out that she is in fact pregnant with three babies (or fetuses) as "they" like to call them. But let me not go any further. Why don't you read the rest for yourself. The following is from my friend Fr. 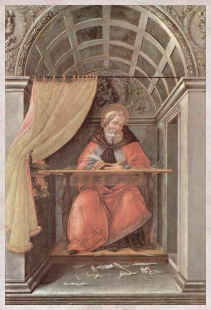 Ignatius. 1. Give God what is right – not what is left. 2. Man’s way leads to a hopeless end. God’s way leads to an endless hope. 5. In the sentence of life the devil may be a comma but never let him be the full stop. 6. Are you wrinkled with burden? Come to Church for a faith lift. 7. When praying, don’t give God instruction, just ask His guidance. 8. Don’t wait for six strong men to take you to the Church. 9. If we don’t change God’s message, His message will change us. 10. When God ordains, He sustains. 11. Plan ahead – it wasn’t raining when Noah built the ark. 12. Most people want to serve God, but only in an advisory capacity. 13. Suffering from truth decay? Brush up on your Bible. 14. 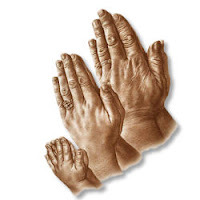 Exercise daily – walk with the Lord. 16. He who angers you, controls you. 17. Worry is the dark room in which negatives can develop. 18. Give Satan an inch and he will be a ruler. 19. God does not call the qualified. He qualifies the called. 20. Read the Bible – it will scare the devil. H/T to Easter for sharing this with me. 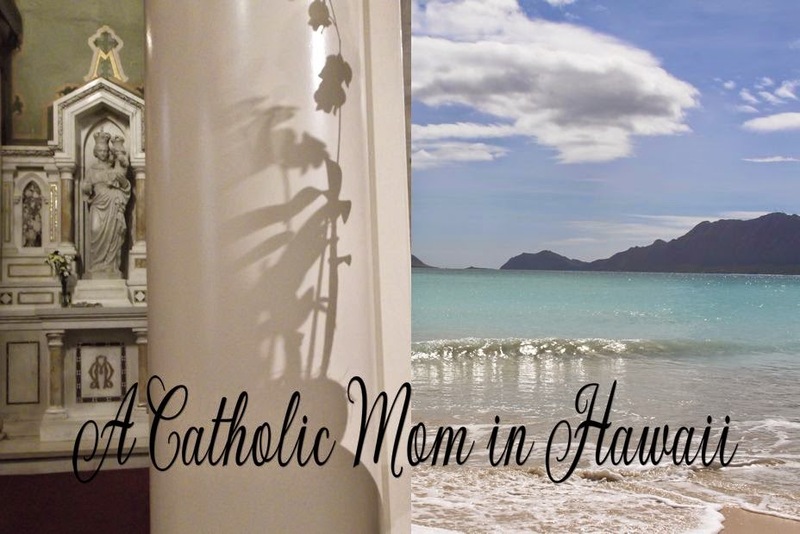 For Catholics living on Oahu, one of our favorite places for Catholic resources is at Pauline Books and Media. Visiting with the dear sisters and their gracious staff is always a pleasant experience as well. One of the Pauline sisters on the mainland, prepared a couple of videos with her book recommendations and the following one is for Lent. 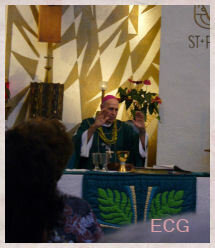 My mom shared that in her diocese, Bishop Serratelli will be celebrating the ancient custom of burying the Alleluia. blow the shofar and everything just stopped and there was total silence." last time and then he rolled up the scroll and placed it in a small coffin." bearing the 'Alleluia' scroll was buried in a small grave that had been dug. rooms. 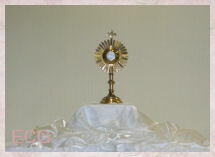 Lent had officially begun," he said. signaling the great joy that Christ had risen from the dead," he said. 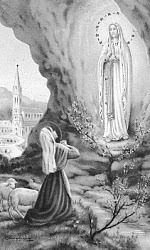 February 11th is the Feast day of Our Lady of Lourdes. 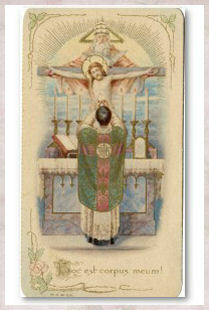 Since it falls on a Sunday this year, it will not be celebrated during the Mass. 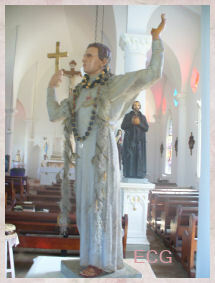 On a personal note, my home parish was our Lady of Lourdes and that of my dear husband's family was St. Bernadette's. We were married at Our Lady of Lourdes Catholic Church. She holds a dear spot in our hearts. 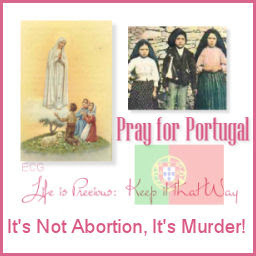 Today, let us ask our Lady of Lourdes to intercede for Portugal. To protect it from the evils of abortion on demand. To learn more click title above.